TEKVOX has announced enhancements to its 71000 Drop-In A/V® product portfolio, which ensure easy integration as comprehensive platform solutions and provide maximum value for customers. The TEKVOX Drop-In line has been simplified and now centers on four primary configurations: the 71011 Managed Digital Foundation entry-level Drop-In, the mainstream 71021 Drop-In for a variety of single display applications, the powerful TekFlex multi-display solution for classrooms, lecture halls and executive conference rooms and the 4K MultiView Drop In for active learning/collaboration environments with our without video conferencing support. 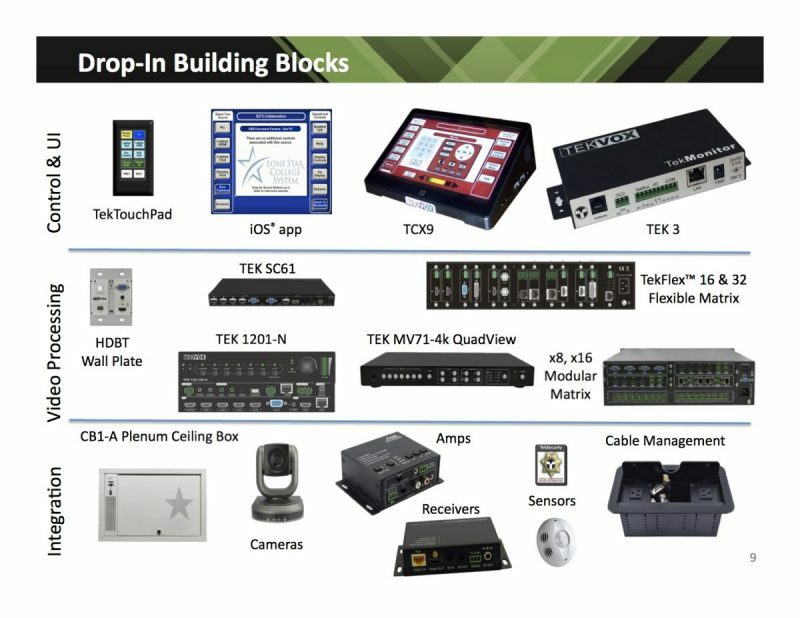 TEKVOX Drop-In A/V® solutions are complete, highly automated, networked managed and factory-programmed. They are configured for easy integration and installation, reliability and simple maintenance. Within the standard Drop-Ins, application-specific configuration options include combining or dividing rooms at a touch, optimizing conference table installation, adding podium/credenza inputs and control to conference rooms, and making conference rooms and board rooms ready for complex audio and VTC integration. Two optional Drop-In sub-configurations, which may be appropriate for certain users, offer -DA (Direct Attach) and -NA (No Audio) configurations. Separate Booster Packs may be ordered to fine tune Drop-In configurations. They further enhance Drop-Ins with touchscreen capabilities, 4K upgrades cable options and more. TEKVOX configures, tests and kits Drop-In solutions in a single package. TEKVOX also designs and manufactures customer-specific solutions as needed.